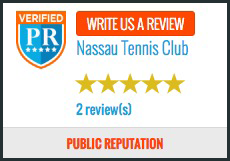 Nassau Tennis School is dedicated to providing the best tennis instruction to each and every player, whatever their ability or ambition. From beginning “Pee Wees” all the way up to serious tournament competitors, there is a group tennis lesson program available to meet your needs. Our group clinics focus on the development of physical, emotional and social skills. Emphasis on hand-eye coordination development. Introduction to stroke FUN-damentals, basic court terms and Positions. Stroke production and mechanics. Development of movement and sustained shot combinations. Reinforce fundamental shots, introduce specialty shots, promote comprehensive point play. Competitive opportunities to develop strategy. Honing competitive toolbox. Situational reaction, strategy implementation, stroke refinement. Interactive point construction drills. Match play. Taking the game to the "Next Level". Competitive development including drills, points, strategy and fitness. If you are new to the Club, please call us at 908-359-8730 for an evaluation. We are constantly adding new adult tennis clinics to meet the needs of our customers. If you do not see what you are looking for, or are unsure about what clinic to enroll in, please call us!